What do you eat for breakfast? I get this question a lot since I found out I was intolerant to eggs, dairy, wheat and gluten. I am a breakfast person so I’ve had to come up with alternatives - this quinoa pop muesli with cocoa nibs is a super-tasty and healthy gluten-free alternative. And what are quinoa pops, you might ask? Quinoa can be popped, a bit like popcorn. They won’t get anywhere near the size of popcorn but the taste is fantastic. You can do this yourself but I buy organic quinoa pops from a health food shop. I eat a lot of quinoa – whether it is cooked quinoa, or quinoa pops. Quinoa is technically a seed and is rich in nutrients and contains healthy essential omega fats. Quinoa is also rich in protein so it helps to fill you up. I add four different seeds and raw cocoa nibs to this muesli. Yes, really – I sometimes eat chocolate for breakfast. Raw cocoa nibs though, are nothing but coarsely ground nibs from cocoa beans which have been sun-dried and gently fermented – there is nothing else added so don’t expect the smooth taste of chocolate. I actually think they taste a bit like coffee. Raw cocoa nibs are rich in antioxidants, different minerals and fibre - but is also a stimulant as it contains theobromine, which can have a similar effect on your body to caffeine. 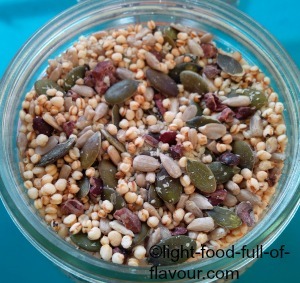 In an ideal world, you would grind all the seeds I add to this quinoa pop muesli as this makes the nutrients in the seeds more easily absorbed. I like a bit of crunch though, so the only seeds I grind are the sesame seeds. Sesame seeds are rich source of selenium, a mineral which may help to protect us against certain types of cancer and premature ageing. It may also be essential for the thyroid gland, which controls the body’s rate of metabolism. There is no need to exact with the measurements. You can use either an American cup measure or an ordinary tea mug/cup. I keep the muesli in a sealed jar in the fridge – which is the best place to store most seeds. Mix together all the ingredients and store the muesli in an air-tight container. I eat 3 tablespoons of this muesli together with either berries or a chopped apple and coconut yogurt. You can swap the coconut yogurt for plain yogurt or soya yogurt. 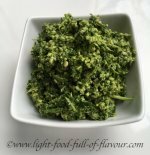 You could also add some ground flax seeds (linseeds) to the muesli.